If you’ve already compared Fire TV and Roku 3, there is not likely to be many surprises latched in here. Point to be noted is that both Fire TV Stick and Roku Streaming Stick tend to deliver the same user interfaces that are already found on their more expensive set-top editions. On Roku Streaming Stick, the customizable grid layout is about as good as it gets – viewers can bring their favorite channels front and center and access them without drilling down into menus or (God forbid) submenus. Unfortunately, Amazon has still not quite figured out how much the audience will dislike the Fire TV user interface, which puts the needs of the e-tailer ahead of the viewer and the credit goes to a noisy default Home menu, which is the reason it actually mashes up everything into one unruly mess – and it keeps all the stuff you would want buried in those aforementioned submenus. If you are not concerned about user interfaces, then definitely Google’s Chrome cast is likely to woo the market as well your heart too. There is essentially no UI to speak of, since everything happens from a compatible Smartphone or tablet app, which is used to “cast” content to an HDTV. Although you can continue to hope Amazon will see the bright light, for now Fire TV Stick will have to take a backseat to reigning UI champion Roku, with a second-place nod to Chrome cast for choosing to just get out of the way entirely. Well, everyone is crazy about gaming. And a device without gaming feature would be a clear waste. 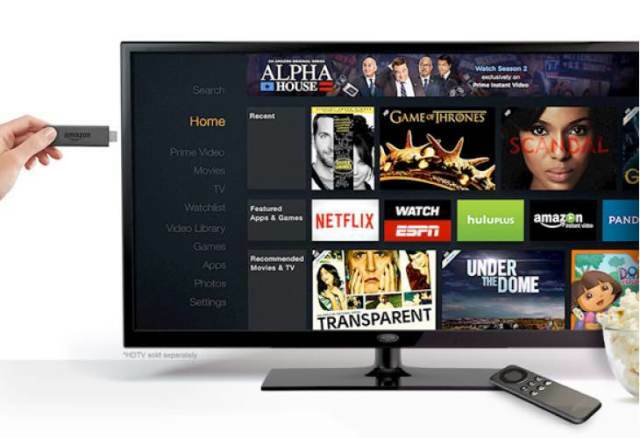 There is no necessary recommendation of buying a streaming stick for even casual gaming, but Amazon handily dominates this realm at the moment, and the credit for this goes to Fire TV Stick’s ability to use the Fire Game Controller which is available separately, originally offered with the Fire TV media streamer. While it’s not going to replace anyone’s PlayStation 4 or Xbox One, Amazon has bulked up its gaming content with tons of free titles as well as paid games starting at only 99 cents that includes Flappy Birds Family, The Game of Life and Sonic the Hedgehog 2. By comparison, the Roku Streaming Stick completely abandons the Roku 3’s ability to play Angry Birds and a selection of other titles, while Google’s Chrome cast was never intended to play games at all, so it will be a vain to see anything or expect anything here. It will be a clear waste. Amazon has a big time party here to enjoy! Much like Fire TV, the Fire TV Stick is quite the potent beast when it comes to raw hardware specifications, featuring a dual-core processor, down from quad-core on the set-top version with 1GB of RAM and 8GB of onboard flash storage. By comparison, both Chrome cast and Roku Streaming Stick remain stuck with single-core processors and a meager 512MB of RAM; the former also includes 2GB of flash storage, while the latter looks positively skimpy with a mere 256MB.